The new Vande Poel-Heeringa Stadium Courts made their debut Monday with the beginning of summer-long programs sponsored by the Hope Tennis Academy. The 12-court facility gives Hope its first college-owned outdoor tennis courts in more than half-a-century. The new courts join the six-court DeWitt indoor facility in comprising the Hope College Tennis Complex at the Ekdal J. Buys athletic fields. The facility includes an officials' shelter and elevated seating for spectators. It will provide Hope athletes with a playing venue they have needed for years -- eliminating the need to play home matches at local high schools. It will also serve community tennis enthusiasts and the Hope Tennis Academy. The courts are named for Earle Vande Poel '35 and George Heeringa '36, doubles partners on the Hope tennis team in the 1930s, and made possible by a leadership gift from the Ted '72 and Barb '73 Etheridge family. 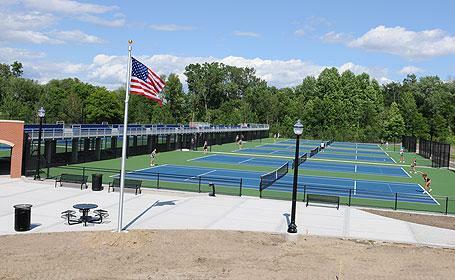 The new courts are located close to Hope's DeWitt Tennis Center which features six indoor courts. The Hope College Tennis Complex is part of the Ekdal J. Buys outdoor athletics facility, joining the Gordon Brewer track, the Boeve Baseball Stadium, Wolters Softball Stadium and Van Andel Soccer Stadium. Hope Summer Repertory Theatre (HSRT) continues its 41st season with Joan Cushing’s Diary of a Worm, a Spider, and a Fly, based on the books by Doreen Cronin. This production opens on Monday, June 18 at 10:30 a.m. in the Studio Theatre in the DeWitt Center. Additional performances are at 10:30 a.m. on June 20, 25, 27, 29, July 30, August 3 & 8 and at 1:30 p.m. on August 1, 6, & 10. Tickets are $12 and the shows are general seating. Frank C. Sherburne Jr. of Holland, who had taught mathematics at Hope College for 35 years before retiring in 1994, has died. He was 83.